My trio with Mike Holstein, bass and Sonny Thornton, drums, will be performing at St. Matthias Church at 3:00 pm, this Sunday afternoon May 17th. Our performances are magical, and I'm thrilled every time we get to play together! To get to St. Matthias Church take the Charlotte St. exit off of I-240 and go South (AWAY from the Grove Park). Pass Tripps restaurant and go down the hill to a traffic light at Max St., across from the Public Works buildings. You can see the church up on a hill to the left. Turn left on Max St. and take the first right up a hill to the church at 1 Dundee St. There is limited parking around the church, so you may wish to park in the Public Works building parking lot (turn right at the light into the lot). There will be a shuttle bus from there to the church. New Release - Track 2 from "A Higher Dimension"
Here is track 2 from my solo piano album "A Higher Dimension" to be released in a few weeks... Actually re-released, as it was originally released in 1988 and was the first recording I did where I could say to myself "If I die tomorrow, I will feel complete having done this album." 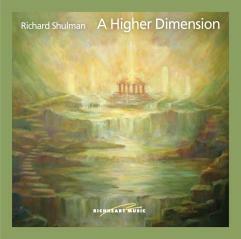 "A Higher Dimension" is Tranquil Solo Piano for Meditation, Healing, and Relaxation, and will be released as a CD and digital download. The beautiful new cover painting is by Reine Laurendeau, and the design is by Diane Couture. Performances and Booth 656 at the International New Age Trade Show (INATS) at the Denver Merchandise Mart, Denver CO. This is a for-the-trade only expo for retailers, wholesalers and manufacturers of uplifting products and services. Sample preview with audience involvement of the Camelot Related Musical I'm writing. At this point in the musical, everyone is meditating on "Heaven on Earth" Both Mark and Molly are distracted by each other's presence in the circle but eventually they each receive a beautiful gift from the meditation. 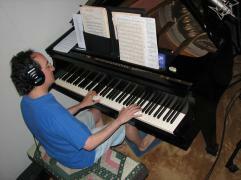 The "Meditation Song" is sung by Nancy Rubenstein, George Peery, Dielle Ciesco, and myself. And just this morning I noticed that the blueberry seeds I planted in a tray are starting to sprout! Love and Blessings for a happy Spring!